Posted by Jenny in hiking, memoir, travel. 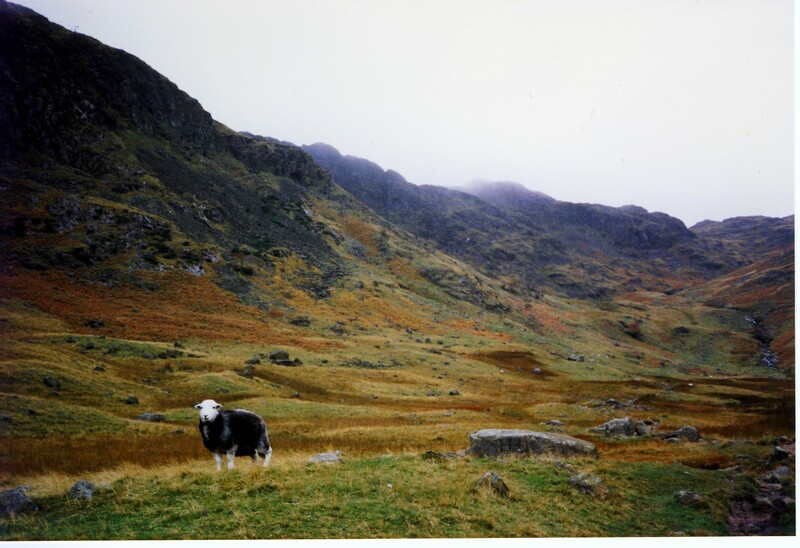 It started with my old boss, Gerard McCloskey, loaning me his Wainwright books about walking in the Lake District while I was over in England for work in October 1989. 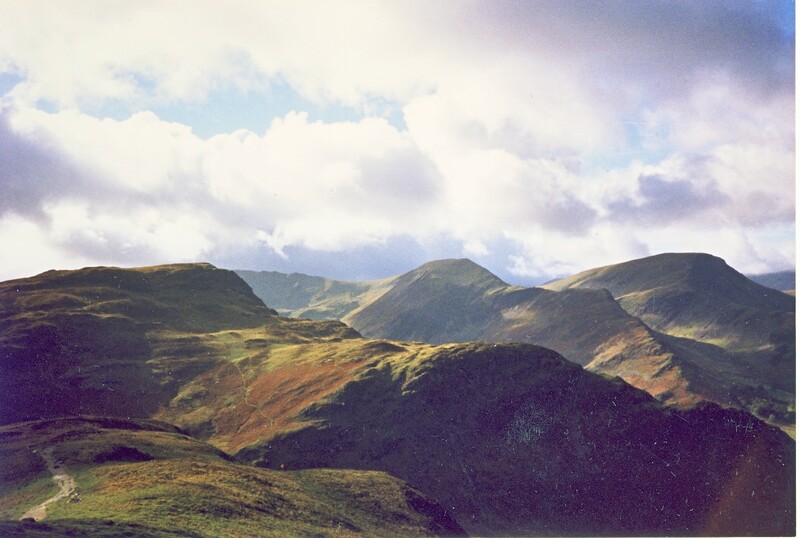 From there it was a spur-of-the-moment decision to do some exploring in the wilds of the Cumbrian Mountains as a side trip. I had no real hiking gear, but I borrowed a backpack—more what you would call a knapsack— from Gerard and, since my raingear was inadequate, I also borrowed an umbrella from his wife Sheila. For footgear I wore shoes that are hard to describe: not hiking boots, not running shoes, but comfortable shoes that were a bit dressy, like something you would wear with slacks to a social gathering. 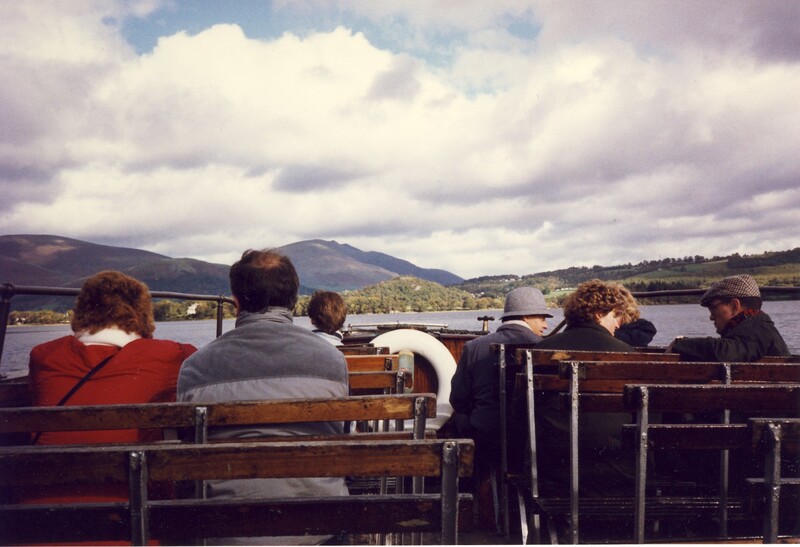 I got from London to Windermere by train and from there to Grasmere by bus, as I recall. (I am going by memory on all of this.) It was a windy, overcast afternoon as I dutifully looked in on Dove Cottage, the home of William and Dorothy Wordsworth. I am quite willing to journey iambically with Wordsworth, but I wasn’t really in the area to look at points of historic interest. I was there to see mountains. I found a small hotel and had a dinner that involved Cumberland sausage and a brew called Old Peculiar. In the morning, after my breakfast of eggs and sausage, fried tomatoes, and toast, I called over to an even smaller hotel in the village of Rosthwaite and made a reservation for the next two evenings. I then started walking toward Rosthwaite. It rained most of the day. 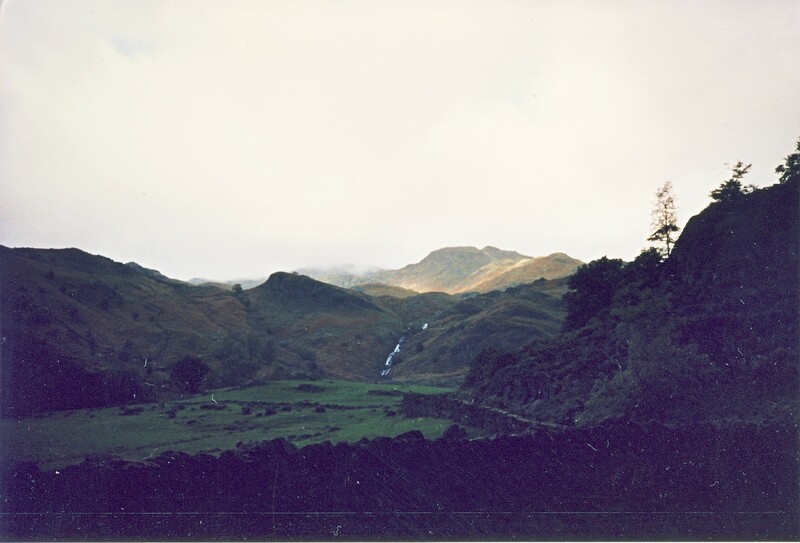 To reach Rosthwaite, I had to climb over the wide divide that separates the watershed of the River Derwent from the chain of lakes that includes Thirlmere, Rydal Water, and Windermere. It was a rough, stony track that took me past guardian sheep. 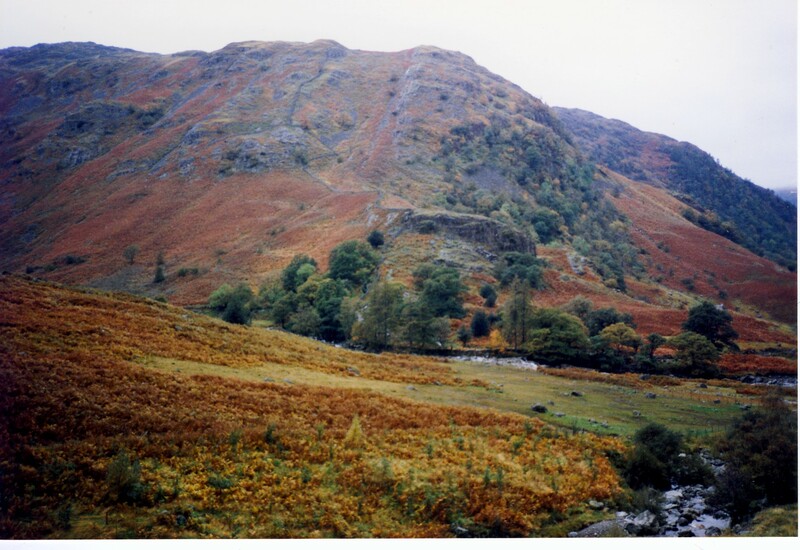 My route took me up the valley of Far Easedale Gill, past the Deer Bields and the Pike of Carrs, and across the height of land at Greenup Edge. At that point my umbrella nearly blew inside out from the wind. 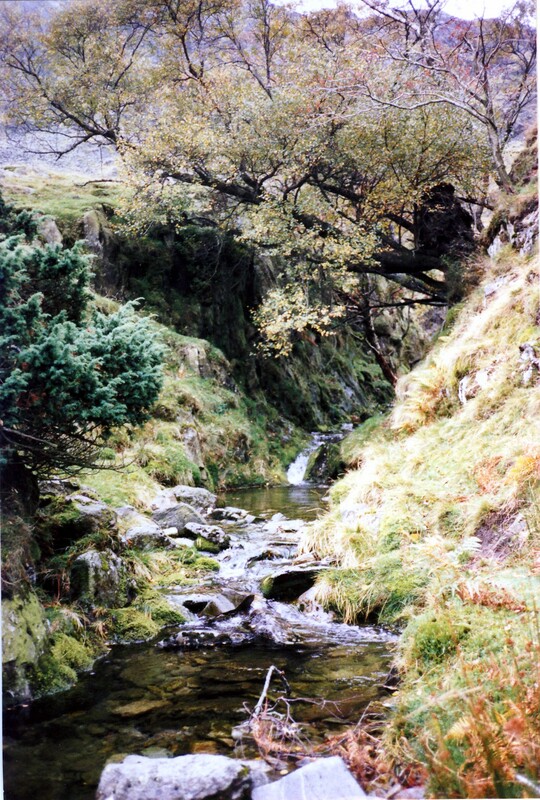 Passing through an unmarked junction of rough paths, I continued northwest along the headwaters of Greenup Gill, between Long Band and Bleak How, and down into Stonethwaite Fell. I passed some small farms. All of the streams were running high (or as they would say in that region, the becks were in spate), and in the picture below you can make out a cascade glimmering in the distance. It was starting to get a bit dim. Right around 4:00 I found my Rosthwaite hotel, folded my umbrella, and walked in. The proprietor said, “Good to see you, Miss Bennett. We will be serving tea in ten minutes.” Hot tea and cookies, which I had in the dining room with three or four other guests, have never tasted so good. 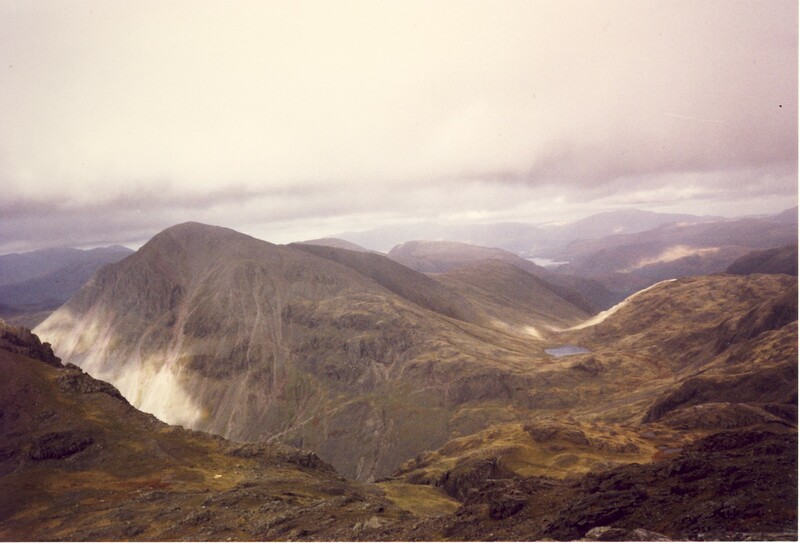 The next day I walked down the Borrowdale valley and climbed Scafell Pike, the high elevation point of England (3209). 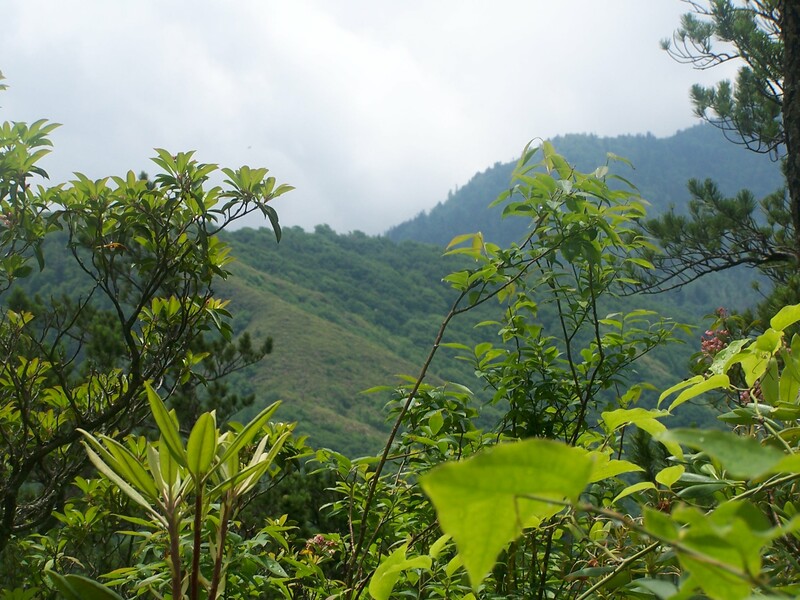 From where I started, it was a climb of about 2900 vertical feet. 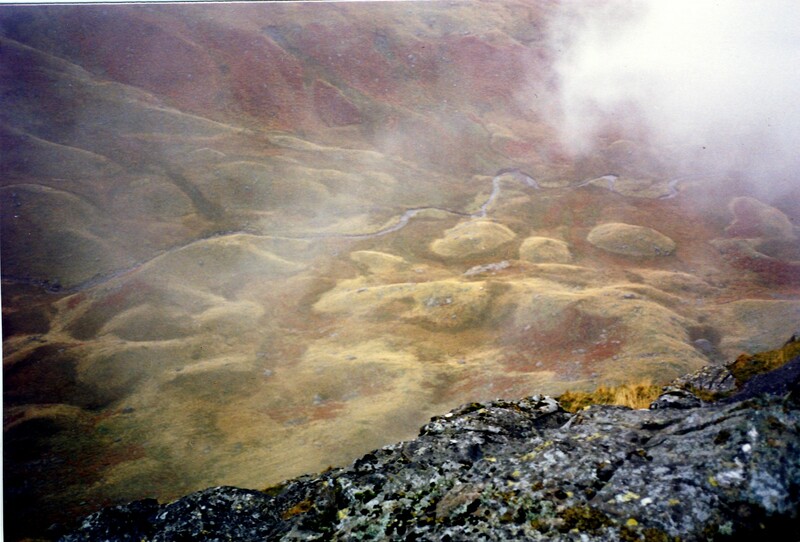 The Pike is a rugged mountain studded with sharp stones and riven by steep gullies. I took a well-traveled route, going up along Grain’s Gill. Then I passed Sprinkling Tarn. The clouds were just brushing the mountain. 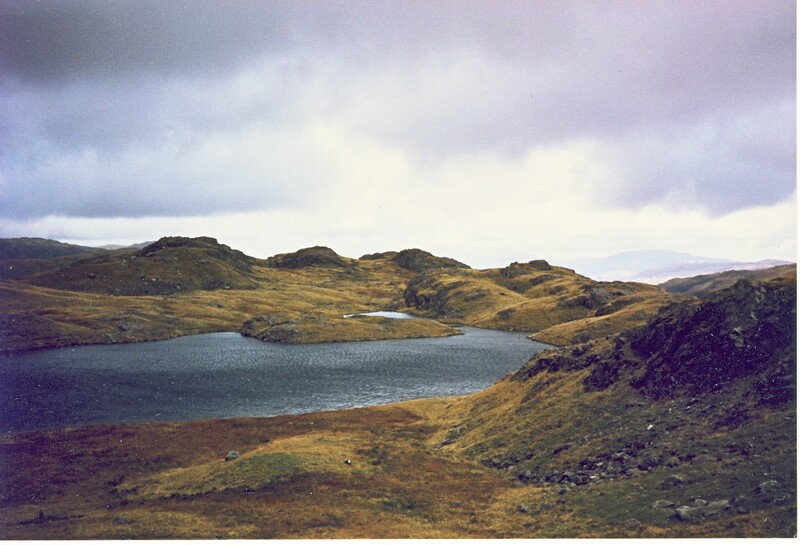 I believe the next picture was taken looking past All Crags over Angle Tarn, but I wouldn’t swear to it. The path was easy to follow, but at no point were there any signs—not at trailheads, junctions, or destinations. I hope that is still the case, and I applaud the English for that tradition. 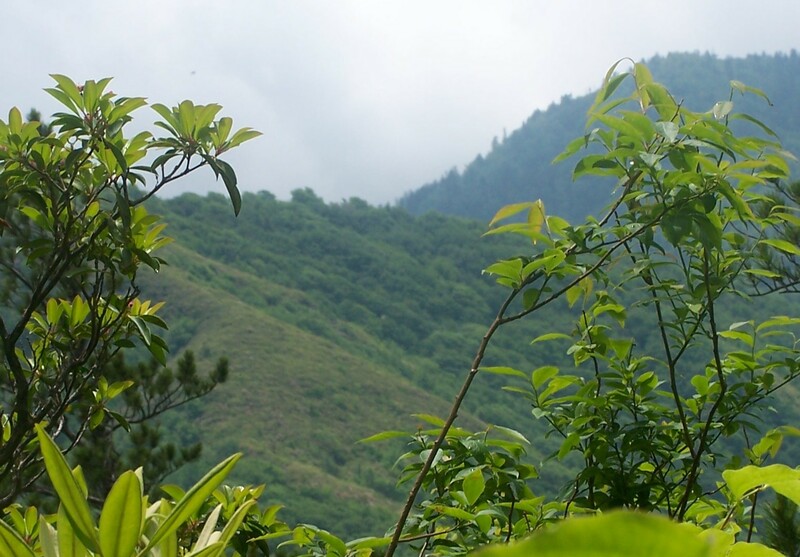 It was not hard to find my way to to the summit, but when it was time to descend, many somewhat confusing paths led toward widely separated valleys. Picking my way carefully over the scree, I sorted things out and followed the path that led past the Round How and back toward the Borrowdale valley, a route that roughly paralleled my ascent. I saw some interesting formations of grass and hill on the way down. I remember that at this point, my ankles were getting a little tired in my thin, low-topped shoes as I stepped from rock to rock, but I am strangely proud of the fact that I managed to pull off this … feat. Eventually I wended my way back to the Rosthwaite hotel in time for dinner. The next day I headed north toward Derwent Water, a large, clear lake. I followed the River Derwent a short distance, then scrambled up to the top of the ridge that lies to the west of the river. The ridge, or at least part of it, is labelled as Narrow Moor on my map. I passed High Scawdel, Lobstone Band, and Nitting Haws. Clouds were scuttling across the sky, creating a patchwork of light and shadow (see top picture). 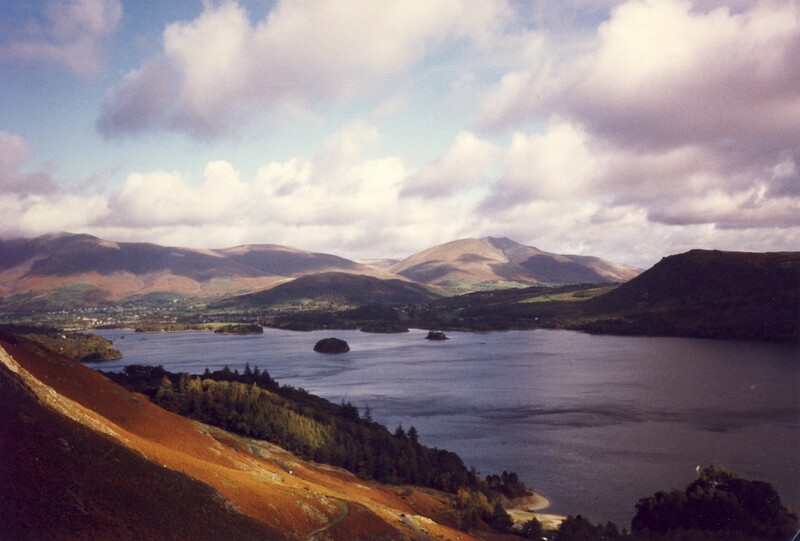 The ridge terminates in some hills called the Cat Bells, which I descended down to the lake. I knew that a boat circled the lake in a clockwise direction, touching at various points at scheduled times. I recall that I had a timetable for the boat, and at any rate, I walked to Hawes End and waited for the boat. I had a bit of trouble at first believing that the boat really existed, but eventually I saw it approach, and I boarded it for the journey to Keswick. I strolled around Keswick (pop. 4800) in the late afternoon. The next morning I visited the Pencil Museum. That deserves its own post, because I need to explain why pencils are so interesting and fill people in on what they have to do with my mother. That will be my next entry in this blog. 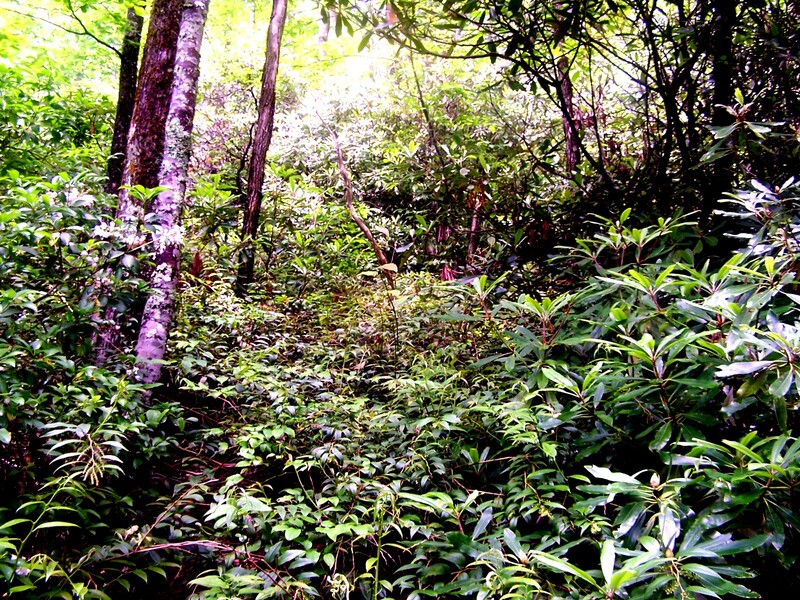 Back in the land of towering green ridges and plunging stream valleys… six days of being in the Smokies. 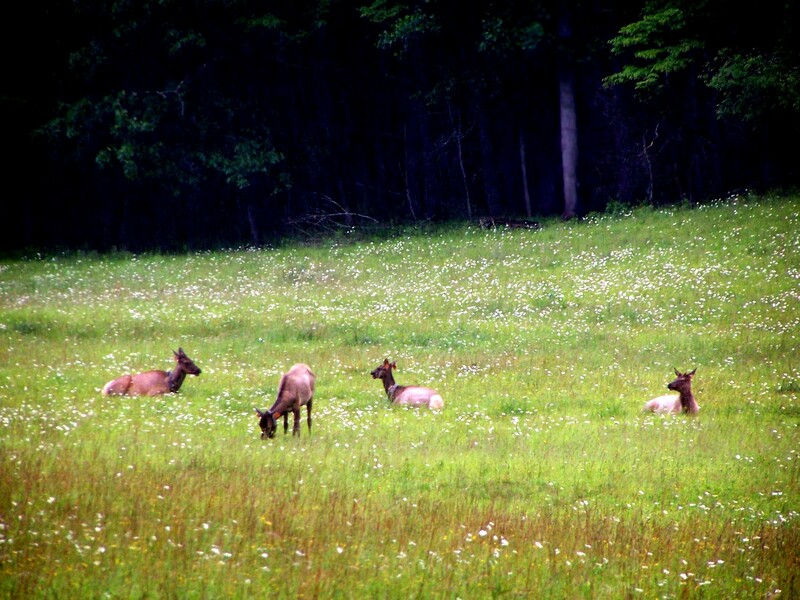 I visited Cataloochee to meet up with Ray Payne of the Smoky Mountains Hiking Club and see the herd of elk that have been introduced there. Ray volunteers with the Park Service as a member of the “Elk Bugle Corps” to give information to park visitors and sometimes keep them from getting up too close to the elk. The best time to view the elk is dusk, but I got there early and did a stroll on the Caldwell Fork Trail, where I saw a lot of laurel along the stream and noticed a good-sized hemlock. 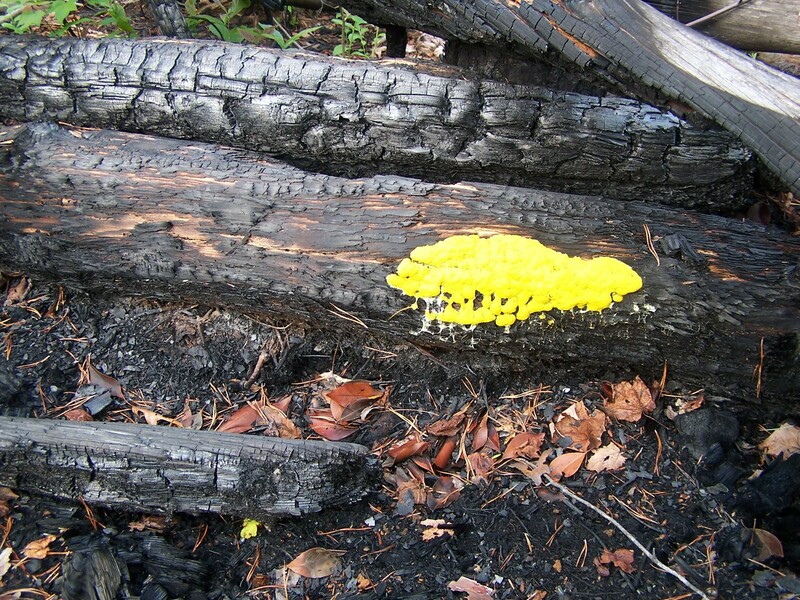 The base of it looked fine, but the top is about two-thirds dead, affected by the adelgid like most of the hemlock in the area. But although I saw a lot of dead hemlock, it didn’t alter the whole appearance of the area as drastically as I had feared. I connected with Ray at about 4:00. He drives all the way from Knoxville every couple of weeks, going over the infamous Cove Creek dirt road (which has some good dropoffs without guardrails) to get to Cataloochee. I’m not sure which is worse, Cove Creek or driving through the Pigeon River Gorge on I-40. We had a great time catching up on things. He is the conservation chair for SMHC and continues to do a tremendous amount of work on the North Shore Road problem over on Fontana Lake. It was raining pretty hard when we first drove up past the ranger station, but we saw three bull elk with impressively large antlers and a separate herd of does. 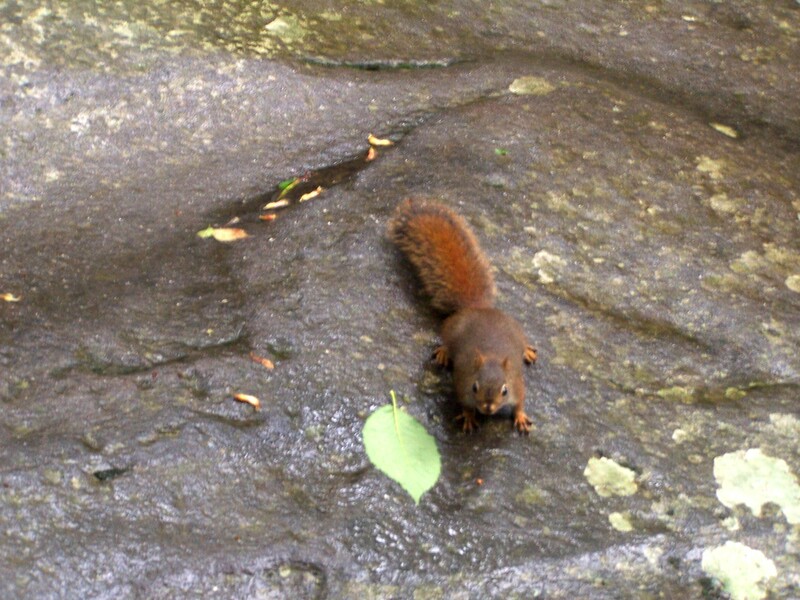 We saw them in different combinations as we chatted over the next few hours. 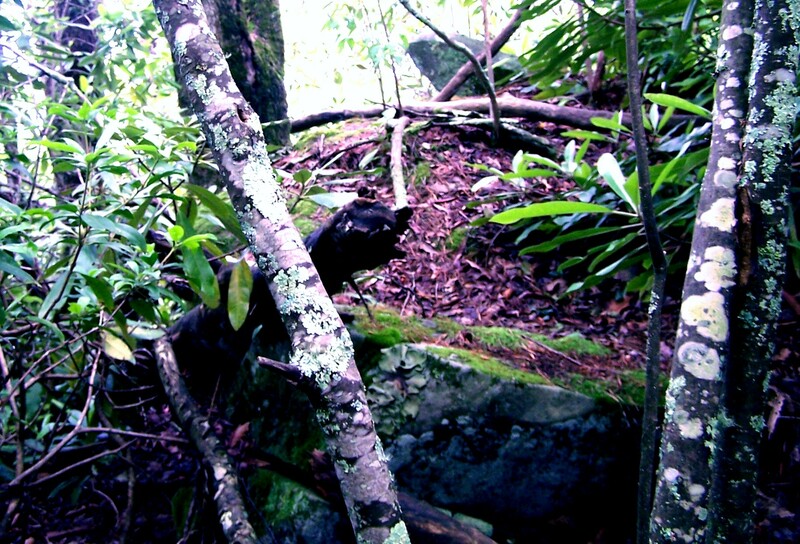 The next day I did a climb up to the top of LeConte up the Rainbow Falls trail and down the Bullhead trail. The dimensions of the hike are relatively hefty (about 14 miles and 4000 vertical feet), but the going is very easy, at least compared with the 9-mile, 4000-foot vertical hike I did on Mt. Washington the previous weekend. I picked this hike because I liked the idea of going through all the plant/climate zones on LeConte. 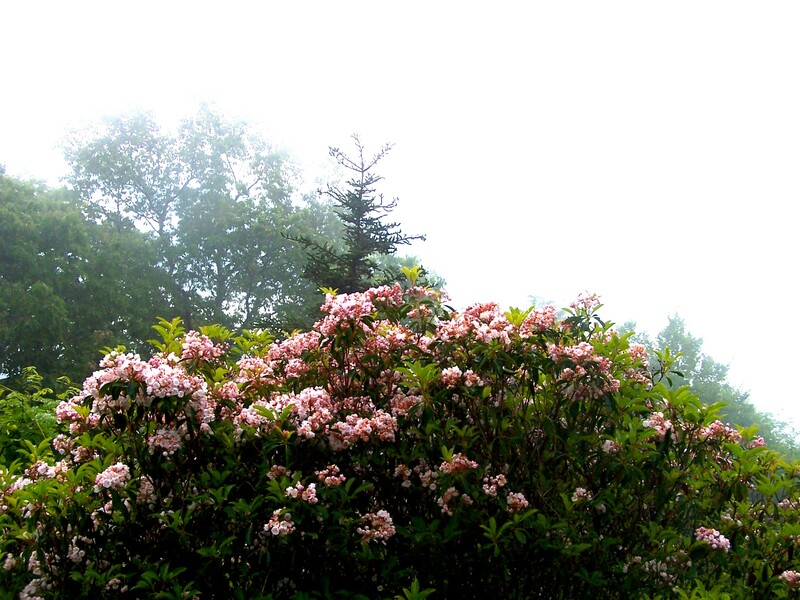 I got into fog at about 3500 feet and stayed in it most of the hike, but that didn’t matter at all. 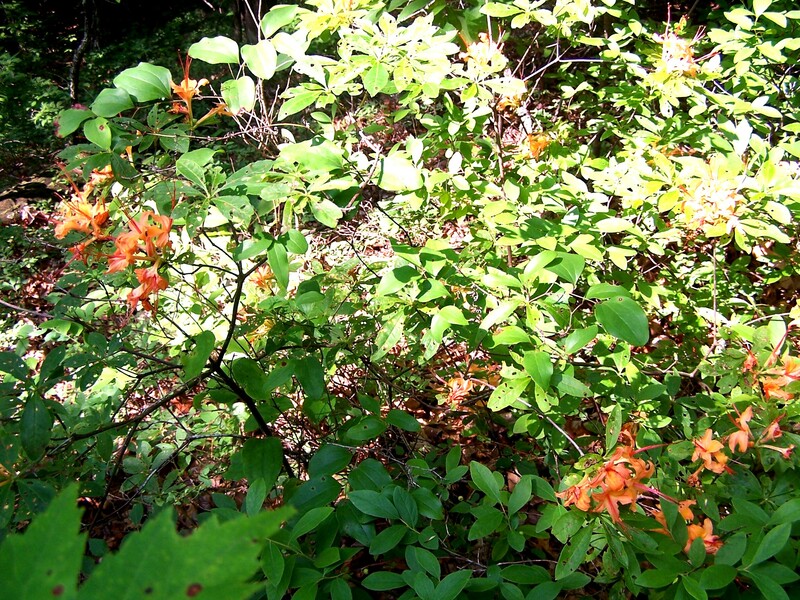 At Rainbow Falls, there was a catawba rhododendron in bloom right at the top of the falls. 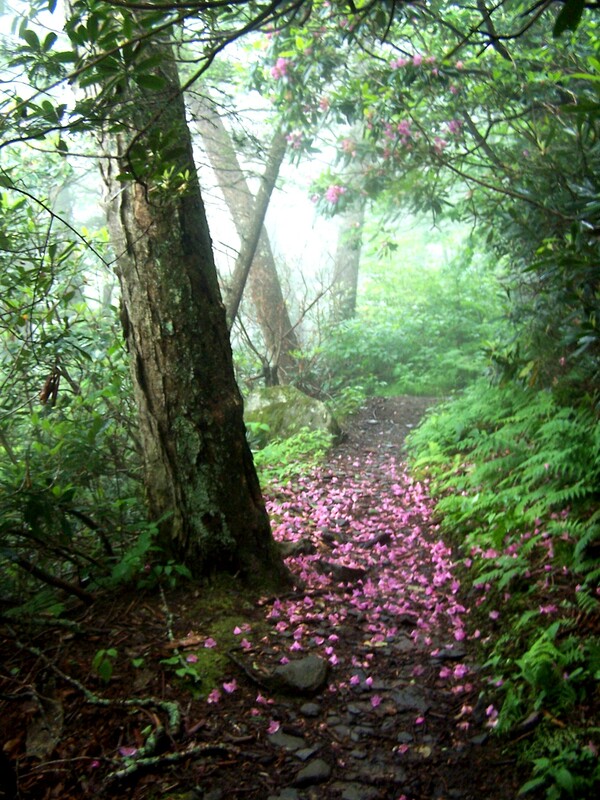 At one spot above the falls, the trail was carpeted with rhodo blossoms. 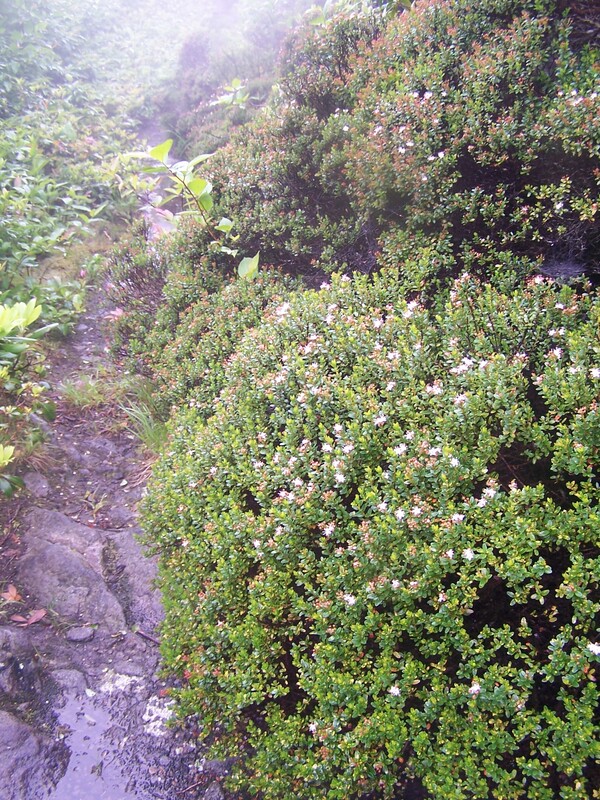 The myrtle was just starting to bloom along the Rocky Spur side trail. I was pleased to see that the Fraser firs are looking better on the top of LeConte. Most of them died 20 or so years ago, and areas above 6000 feet used to have a skeletal, devastated look, but now there are a lot of new firs in the 10-15 foot range. 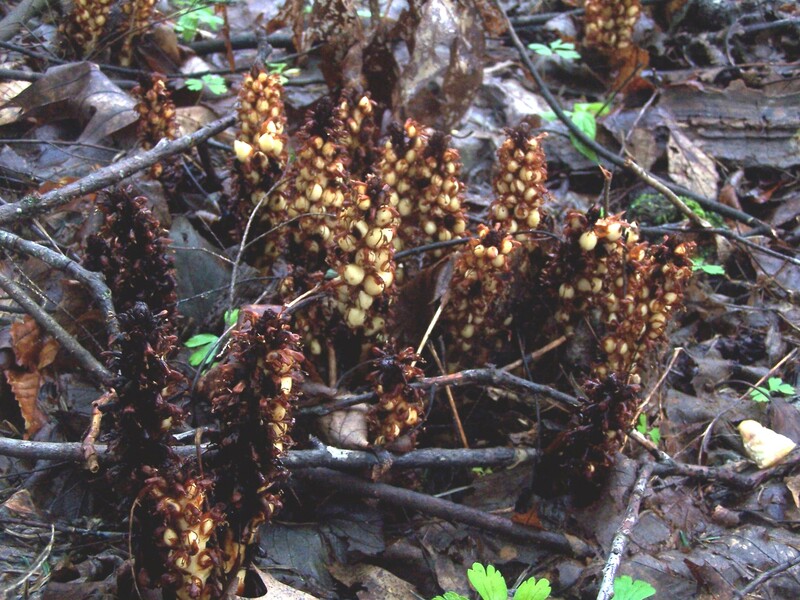 People are waiting to see if this new crop will survive. 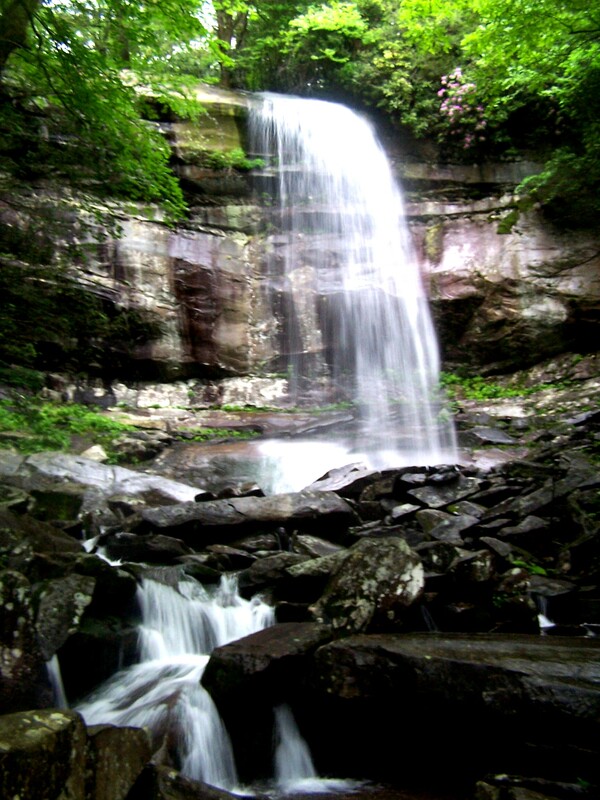 I ran into a number of people between Rainbow Falls and the top, and the Lodge seemed busy. But as soon as I got down on the Bullhead Trail, I saw not a single person until I was all the way back at Cherokee Orchard. Sidehilling below Balsam Point, the slope (as opposed to the trail) was very steep, and I couldn’t believe that 20 years ago I rockhopped up the headwaters of Big Branch from the Newfound Gap road with an SMHC group. But those places always seem impossible looking down from the trail. The next day I attended the concert at Cades Cove described in the post below. One of my poems that was set to music and performed by the Knoxville Symphony was about a solo trip I did up Brushy Mountain from Long Branch Gap. For the following day (Sunday the 14th) I had invited some people to join me for another off-trail hike in the area, but it turned out no one could make it. I decided to go up anyway on my own, back up to Long Branch, but I would head to the other side of the gap, Mt. Winnesoka. It’s an easier hike, since it doesn’t involve crawling through the heath on Brushy. After the valley closed in I started rockhopping up the stream. 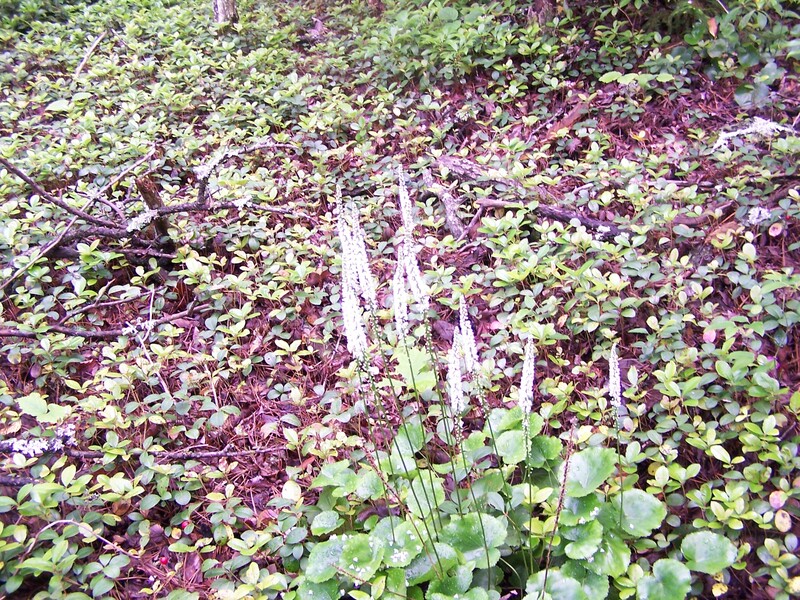 There were plenty of stinging nettles. Still not terribly impressive. After touching this point, I continued along the ridge and then dropped back into Long Branch for the trip out. 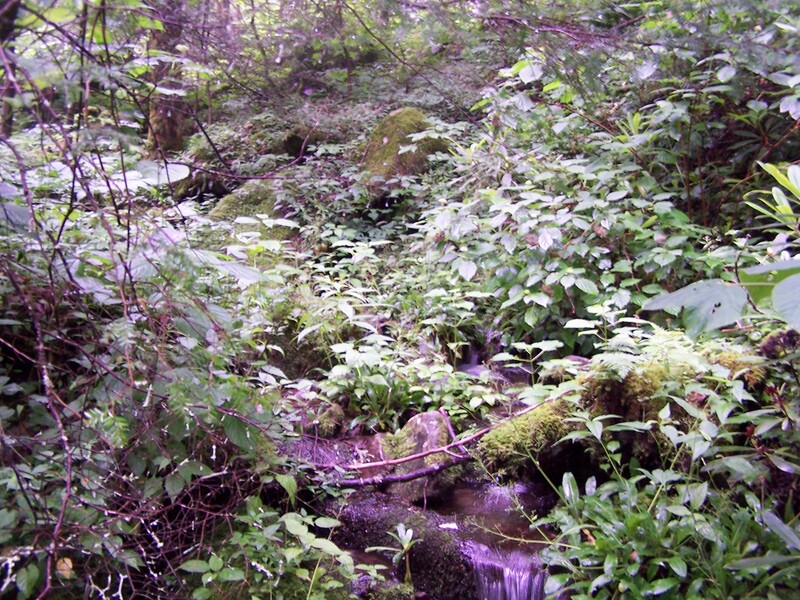 This trail is hardly used, for two reasons: it has a ford of the Little River at its western end and very restricted parking on Wears Cove Gap road at its eastern end. Going up to the trail’s high point at Joint Rock made a nice easy hike the day after I did Winnesoka, 5 miles roundtrip and 800 vertical feet. 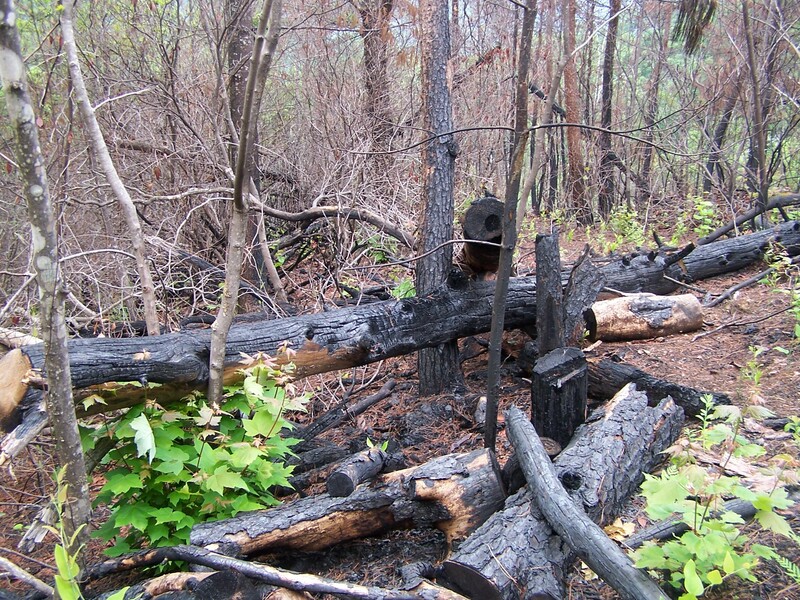 The first (easternmost) part of the forest had experienced a burn. 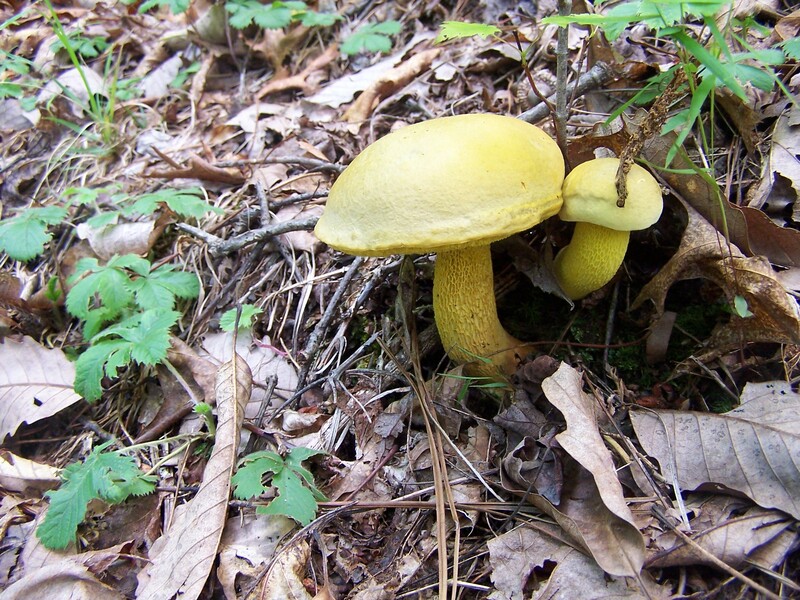 This trail was also good for mushrooms. These made me think of a parent and child, though they probably actually sprouted at the same time. The next day I met up with an old friend from Knoxville for a stroll on Lumber Ridge, a place that seemed noteworthy that day mainly for bugs and mugginess. But it was good to catch up before I headed home. What I always remind myself is that these places are waiting, these streams and these waterfalls are still flowing, at this very moment even though I am now far away. 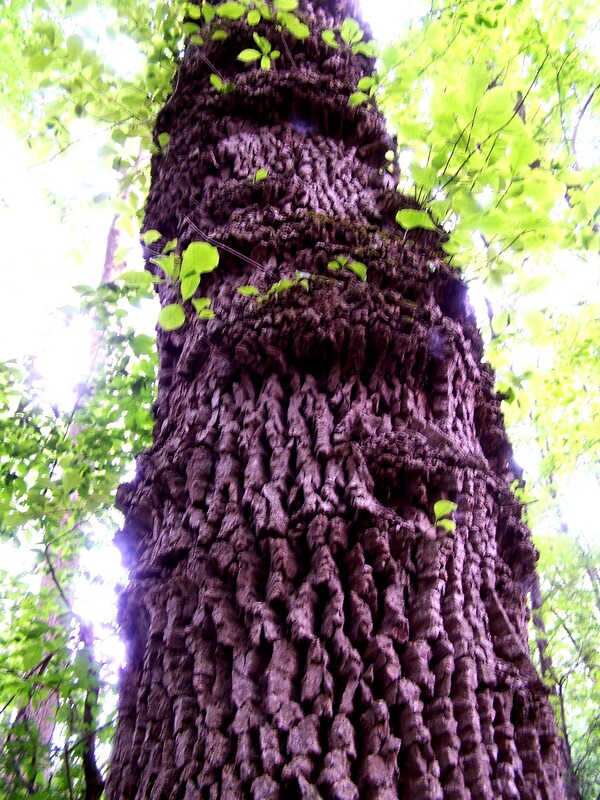 Posted by Jenny in bushwhacking, hiking, music, poetry, Smoky Mountains. I took the photo 6/14 from the other side of Long Branch Gap from a place described in the composition. I will post about this outing soon. On June 13 I had the unusual and wonderful experience of hearing words that I’d written about off-trail explorations performed as part of an orchestral piece. The occasion was a concert in Cades Cove to commemorate the 75th anniversary of the Great Smoky Mountains National Park. 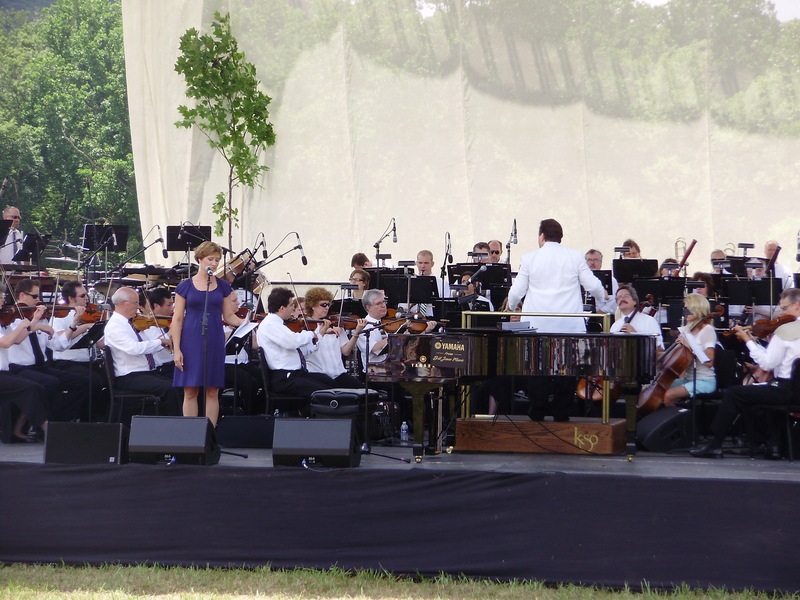 The piece was called “Off-Trail in the Smokies.” It was composed by Jim Carlson and performed by the Knoxville Symphony Orchestra conducted by Lucas Richman on a sunny afternoon before an audience seated in folding chairs in the meadow beside Cable Mill. It was an honor to have three of my poems selected to be narrated to an orchestral accompaniment. This spring I’d heard from my friend Stephanie Seay in Knoxville that the piece had been commissioned and that the composer was looking for material. I sent him a batch of poems and was delighted when he chose them. You can see the words and play an audio file here. 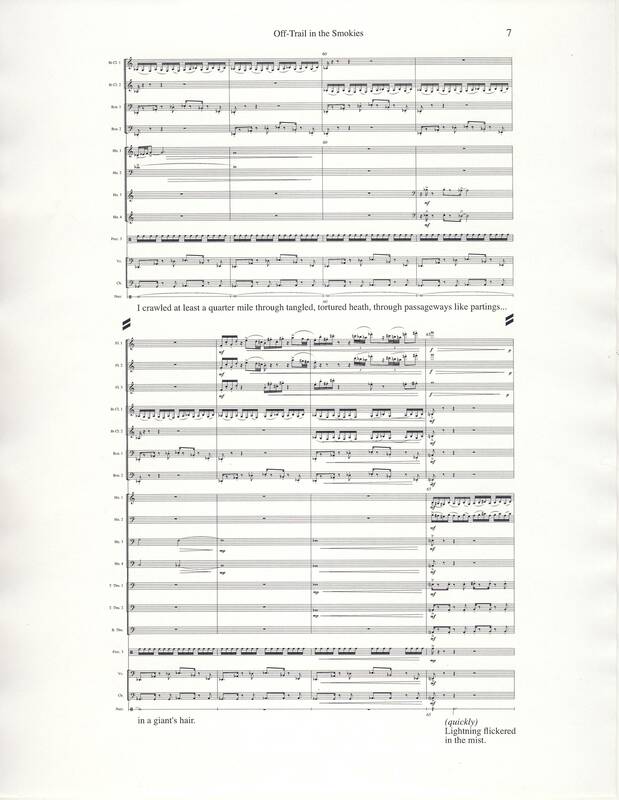 This version has the composer doing the narration; at the concert the narration was done by Katy Wolfe Zahn. What an interesting thing it was for me to have what I’d written interpreted musically. Jim’s interpretation gave my experiences a form that was new and yet harmonized with what I’d described. The second part of the three-part composition was about a solo bushwhack I did up Brushy Mountain from Long Branch Gap. 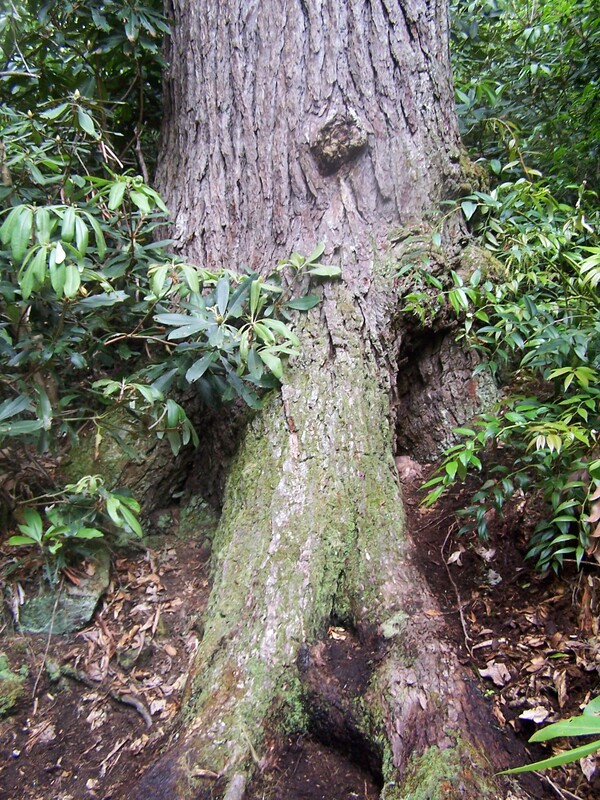 It describes how I’d just managed to work my way through the thick laurel to the summit when a thunderstorm hit. By a convergence of circumstance, thunderstorms also threatened on the day of the concert. But the storms held off until afterwards, when the clouds opened with a drenching rain that once again replenished the infinite greenness of the Smokies. Click on image below, then zoom in for better view.